Although the generalization is usually applied to republics, according to Sir John Glubb, a British author and lecturer, most empires don't last longer than 250 years. As numerous points of interest have arisen in the course of this essay, I close with a brief summary, to refresh the reader's mind. We do not learn from history because our studies are bref and prejudiced. (b) In a surprising manner, 250 years emerges as the average length of national greatness. (c) This average has not varied for 3,000 years. Does it represent ten generations? Does any of this sound familiar? 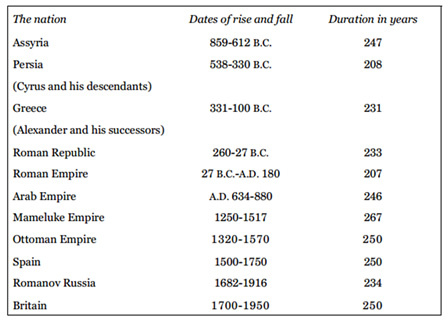 In other words all empires rise and all empires fall. It is the luck of the draw or the happenstance of birth that situates us as spectators of the fall. I know from experience as the Author of The Constitution Failed that if you question the viability of the American experiment even the most humble participant in that experiment becomes indignant. As I have been asked repeatedly, "How can you say, the Constitution failed don't you mean, we failed the Constitution?" This always elicits my response, "Is that a distinction without a difference?" Since the declared and understood purpose to the writing and ratification of the Constitution was to create and sustain a limited government and since We the People now face an unlimited government I maintain we must face the painful reality that the Constitution has failed. With that failure the experiment in individual liberty, personal freedom, and economic opportunity is hurtling towards a destination with destiny as we become like all the other nations of the earth: a command economy with a permanent political class. When did we start our slide from a limited government to a centrally-planned Leviathan masquerading as a utopian paradise? The experiment jumped the tracks under the second president. John Adams signed the Alien and sedition Act and then used that act to arrest anyone who disagreed with him. This was not the beginning of our present slide into totalitarianism. Abraham Lincoln waged total war against eleven States that sought to secede when the right to secede was not withheld from the states and the right to wage war against the States was not afforded to the Federal Government by the Constitution. He did however allow West Virginia to secede from Virginia without the approval of the Virginia government which is explicitly contrary to the Constitution. This was not the beginning of our present slide into totalitarianism. In the midst of the banking crisis of 1932-33 FDR told America, "We have nothing to fear but fear itself." He should have told us that we had him and his Progressive agenda to fear, at least as far as the fundamental nature of the American Experiment was concerned. Despite the fact that by 1932 the recovery from the crash of 1929 was well under way as evidenced by freight loadings that rose 20 percent, industrial production 21 percent, construction contract awards gained 30 percent, unemployment dropped by nearly one million, wholesale prices rebounded by 20 percent, and the battered stock market was up by 40 percent. David Stockman goes so far as to say, "the Hoover recovery would be celebrated in the history books even today if it had not been interrupted in the winter of 1932-1933 by a faux banking crisis which was entirely the doing of President-elect Roosevelt and the loose-talking economic statist at the core of his transition team." The truth of the so-called banking crisis is that the artificial economic boom of 1914-1929 had generated a drastic proliferation of banks in the farm country and in the booming new industrial centers like Chicago, Detroit, Youngtown and Toledo, along with vast amounts of poorly underwritten debt on real estate and businesses. When the bubble burst in 1929, the financial system experienced the time-honored capitalist cure — a sweeping liquidation of bad debts and under-capitalized banks. Not only was this an unavoidable and healthy purge of economic rot, but also reflected the fact that the legions of banks which failed were flat-out insolvent and should have been closed. How great was this meltdown? How many people lost everything in the bank failures? Was this a massive slide into a financial morass? As David Stockman summed it up, "Indeed, a single startling statistic puts paid to the whole New Deal mythology that FDR rescued the banking system after a veritable heart attack: to wit, losses at failed US banks during the entire 12-year period ending in 1932 amounted to only 2-3 percent of deposits. There never was a sweeping contagion of failure in the banking system." Foreshadowing President Obama's first Chief of Staff Rahm Emanuel who said, "You never let a serious crisis go to waste. And what I mean by that it's an opportunity to do things you think you could not do before," FDR used this crisis to forever change the very structure of American government. FDR didn't introduce his sweeping changes in the dead of night. He campaigned on them. He said he would bring in a New Deal for all Americans and he did. As his first inaugural speech ended he laid his cards on the table, "It is to be hoped that the normal balance of executive and legislative authority may be wholly adequate to meet the unprecedented task before us. But it may be that an unprecedented demand and need for undelayed (sic) action may call for temporary departure from that normal balance of public procedure." In these two sentences the new president announced that if he deemed it necessary to upend the balance of powers he would do so. He then threatened to do whatever he thought necessary in the 1933 version of President Obama's "We can't wait" proclamation. Instead of saying "I have a pen and I have a phone," FDR said, "But in the event that the Congress shall fail to take one of these two courses, and in the event that the national emergency is still critical, I shall not evade the clear course of duty that will then confront me. I shall ask the Congress for the one remaining instrument to meet the crisis—broad Executive power to wage a war against the emergency, as great as the power that would be given to me if we were in fact invaded by a foreign foe." Congress did not fight. They did not stand on their prerogatives as a co-equal branch. Instead they knuckled under and in 100 days created an alphabet soup of federal agencies to control everything from soup to nuts. America began its dramatic descent from freedom and liberty to servitude and regulation. With FDR's imagery of a war against an emergency America found itself at war with a recession which had already ended successfully turning it into the Great Depression which wouldn't end for eight more years. Since that time we have declared war on poverty. Fifty years and several trillion dollars later and we have just as much poverty as before. We have declared war on drugs and hundreds of thousands of incarcerations and trillions of dollars later and the drug problem is worse than before. We have of course also been in either a hot or a cold war since 1941 and hundreds of thousands of lives and many trillions of dollars later we have less security than we had before. All of this has led to an erosion of our individual liberty, personal freedom, and economic opportunity. The balance of power has all but dissolved as Congress ceded its power to the executive and the bureaucracy while nine Supreme Justices make all the final decisions. The Constitution was written to set the foundations for how our nation should be ruled. The First Article of the Constitution established the Legislature and most of the document deals with the Legislature, obviously the most important part of our national government. The part that is closest to the people. Today that body has transferred its power and we are faced with an imperial presidency and a Supreme Court that has decreed itself to be the source and the summit of legitimacy. John Locke, the inspiration of much that became our Constitution said in his Second Treatise of Civil Government, "The Legislative cannot transfer the Power of Making Laws to any other hands. For it being but a delegated Power from the People, they, who have it, cannot pass it over to others." Yet this is what has happened and this is why we are no longer forging ahead at the vanguard of humanity. We are instead rapidly becoming the source of raw materials and a market place for the goods of others: a colony in all but name. Or as the saying goes, the borrower is slave to the lender. Everywhere I go and everyone I speak with knows America is losing its edge, sliding down a Progressive rat hole into an over-regulated shabby future in the dustbin of History. At the same time everywhere I go and everyone I speak to says, "At least it won't happen in my day but I feel sorry for the generations coming after me." Why do empires fall? Because they think they won't.